St Benedict Healing a Leper, originally uploaded by Edith OSB. I visited the church of San Crisogono in Rome on Monday. It’s actually a church built atop an existing church – the upper building less than 1000 years old, but the original dating to the 4th or 5th century. The upper church continues to function as a parish, while the lower church is the scene of excavations. This church, not far from the domus or dwelling owned by the family of St. Benedict, was his parish church during the four years or so that he studied in Rome. 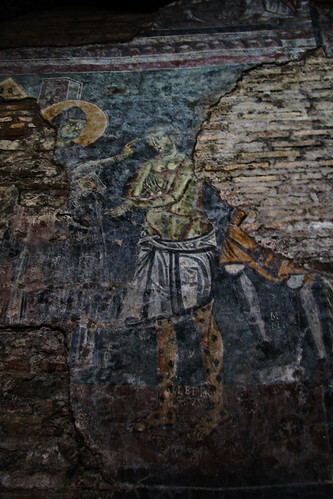 The pastors of this church remembered him when, decades later, he became famous for his rule and the foundation of his monasteries: they recounted many of the episodes of his life in frescoes. Just a few pieces of these have been recovered so far – the one here shows a scene in which Benedict is healing someone with a skin disease, presumed to be a leper. Some parts of the excavations are open to the public, and our group was fascinated with the floor, walls, and carving found throughout the site. It’s really a thrill to walk through Roman arches, into and out of rooms, and know that the founder of the way of life I follow also walked in those spaces – even if there is a gap of more than 1500 years.